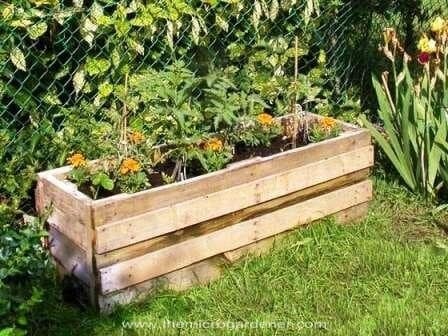 For around $7, you can upcycle your garden with a large wooden crate and a pallet into a miniature garden shed. 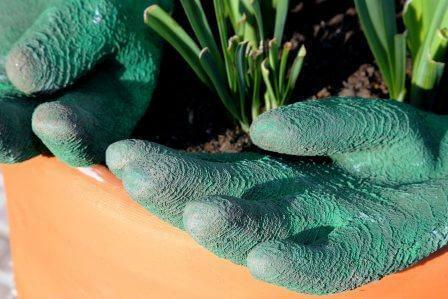 There are so many possibilities for using these seemingly useless materials to complete other projects throughout your garden. An increasing number of gardeners are more thoughtful of the environment and willing to spend the time using these products for new creations instead of hauling them away to the landfill with our trash and waste. This process of creating new products or materials of a better quality or environmental value is known as upcycling. The following are some DIY ideas that you can complete with free pallets most suppliers are more than thankful to get rid of. It’s time to get creative! 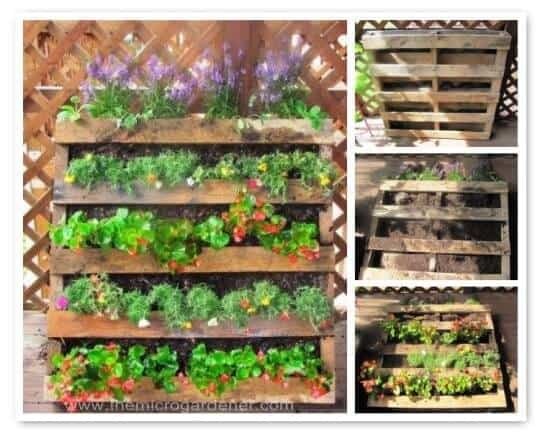 A stunning vertical garden was created from this hardwood pallet, perfect for any narrow space on a small balcony or terrace. The repeating colors bring the pallet to life. There are many benefits of vertical gardens, including maximizing your growing space and requiring less room in the area you have to work with. By stapling landscaping fabric along the back of this soil and plant filled pallet, we were able to create an incredible planter. The finished results are nothing less than inspiring. Both vertical and horizontal space has been stretched to the limits here with a fresh patch containing shallow-rooted vegetables and herbs. 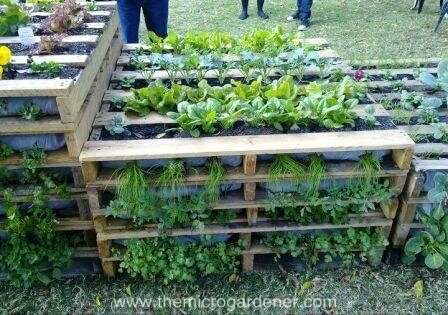 Consider purchasing new pallets and going over safety tips when edible plants will be planted within the pallets. 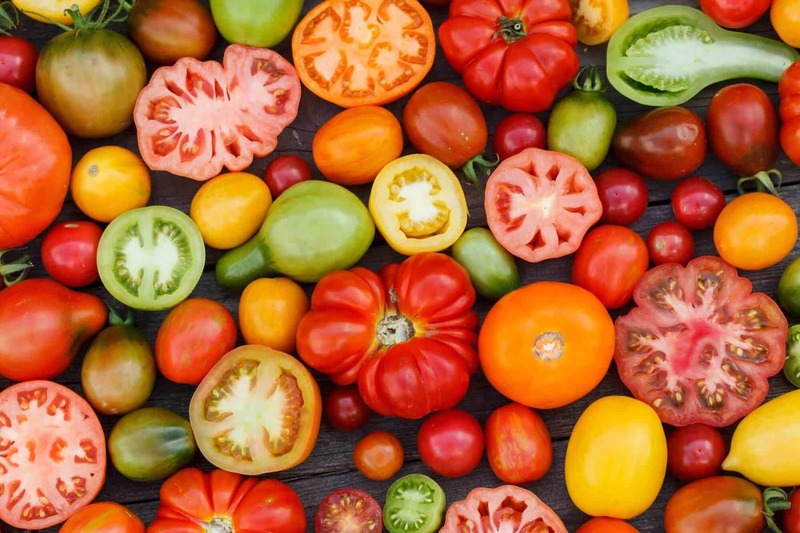 You can grow a surprisingly large amount of food within a single square pallet garden. Luscious vegetables fill the one we show here. 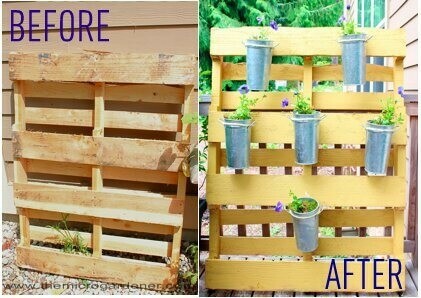 Create an amazing planter with a plain, simple pallet. A creative mind can come up with endless possibilities. This tutorial video will demonstrate how to create your own edible flower pallet garden. Built as a functioning screen, this vertical planter hides a water tank, which was an eyesore. 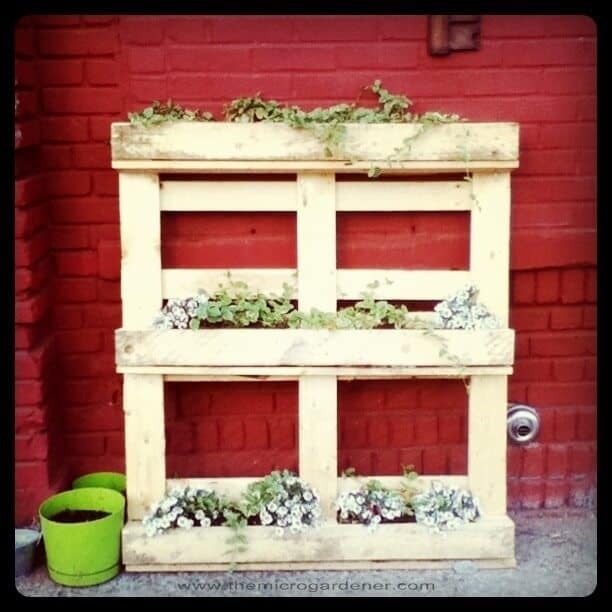 This minimal maintenance pallet garden was a brilliant idea. Found along the side of the road, this salvaged pallet was painted a bright yellow to add privacy when the homeowners are relaxing on a once-exposed deck. It now serves as a colorful planter box and provides a comfortable place to sit and enjoy the peace. You can create more possibilities by adding a few simple brackets, hooks, garden art, or even tea light candles. You can bring several different ideas to life with a pallet including adding a colorful paint theme, taking apart the timber for reuse, hanging it on a wall to use as shelving, or simply using one as it is. Here are a few more ideas to get your creative juices flowing. 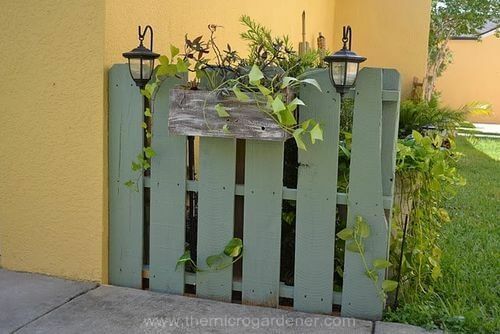 By using a few pallets along with some simple gardening tools and accessories, this painted feature fence was created. It is less expensive to purchase hardwood pallets rather than timber and fence panels. By adding a finish or sealing paint, you create a longer lifespan for your new fence. 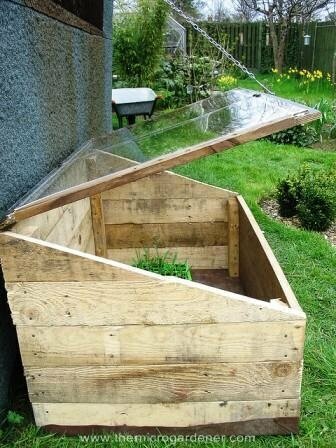 This convenient and inexpensive greenhouse was created by upcycling two discarded pallets. It makes for a perfect environment if you live in a colder climate during winter months. 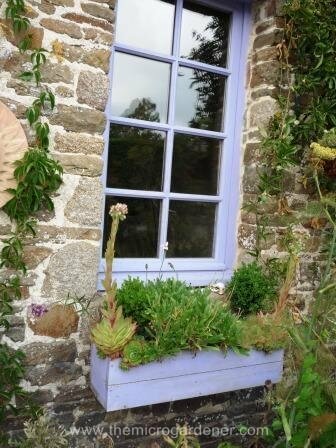 A repurposed pallet was upcycled into this window box. It matches perfectly with the salvaged window frame. 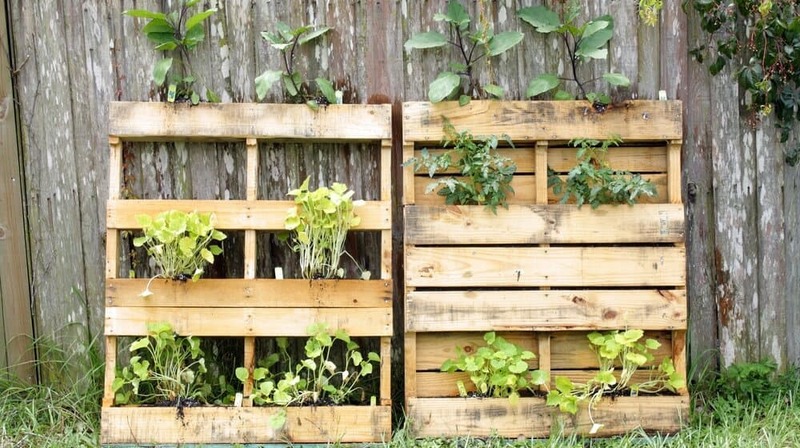 Here are a few examples of how to use pallets in order to raise seeds. During stage one of this project, the four pallet windows created the perfect place to tuck away square pots containing seeds. Useful in several situations, this portable greenhouse can stack vertically. 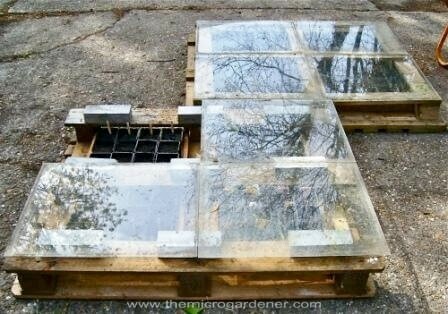 In the second stage, Perspex or glass panes are added to each window of the greenhouse along the top. In some cases, you will need to add pavers to create extra room. Not inspired yet? Here are some more photos of our pallets in use. 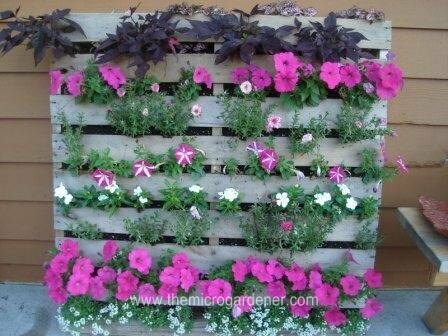 A pallet and lightweight flowerpots creates this simple vertical garden. 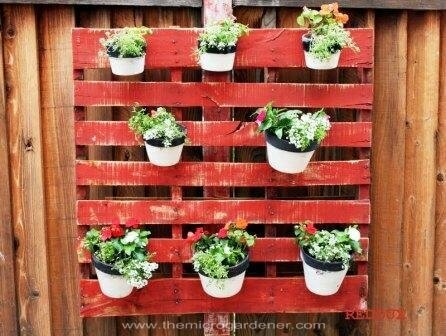 This idea is useful for creating wall art, herb planters, or a privacy screen with a decorative touch. 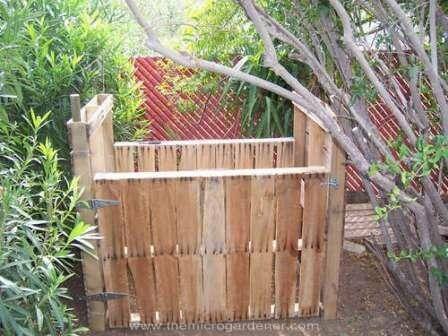 You can make compost bays at a low cost by using pallets. You can add hinges can to include a swinging gate. If you have a garden in a small space, this single compost bin may be ideal for your needs. The link here will take you to a video tutorial to demonstrate how we made our compost bins. 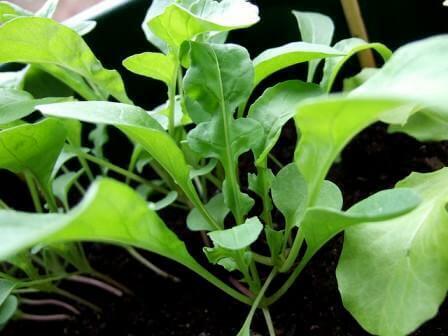 Even a narrow balcony will no longer stand in the way of you having your own edible garden. 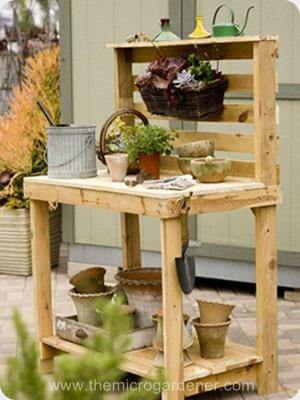 This useful and much needed potting bench was made with thrown away wooden pallets. 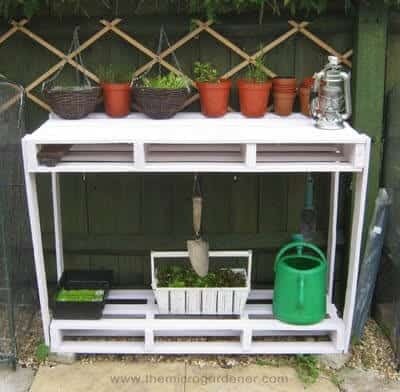 Additional storage and hanging space by adding horizontal timber slats to the back of this potting bench creates a perfect place for hanging small gardening tools. If a simpler bench is what you have in mind, this is another low-cost pallet bench that provides helpful storage solutions. Here we created an alternative to edible pallets with succulents that are resistant to drought and require smaller amounts of water. 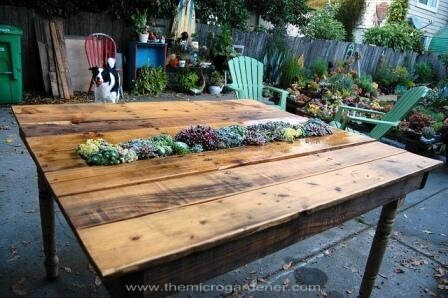 This DIY planter table demonstrates how good a pallet can look with a stained finish and a succulent centerpiece requiring very little maintenance. Pictured here is a simple, less expensive solution for creating a raised vegetable garden. 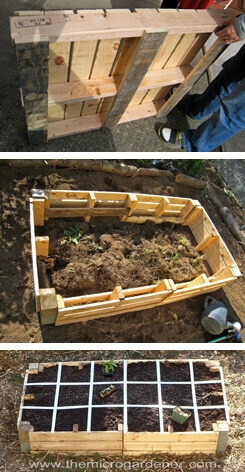 This low-cost raised garden bed used for square foot gardening was created with used pallets. Timber inside of the bed has been protected with a plastic liner, which will preserve the life of the structure. 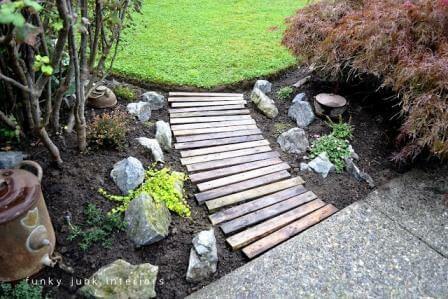 An easy pathway is created here, using the individual timbers of a pallet. A simple sealant prolongs the life of timber. Safety always comes first. Anytime you intend on growing edibles with a pallet garden, you should exercise due diligence first. 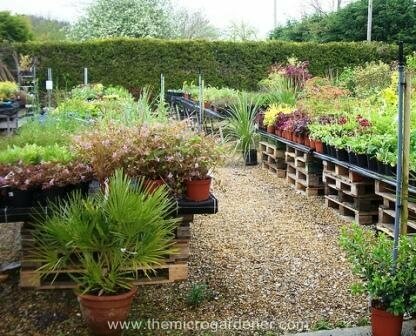 Consider using the pallets as support structures rather than planting directly inside of them. You should also put some thought into the option of using eco-friendly preserving treatments. Always use personal protective equipment when you are handling or cutting any timber. 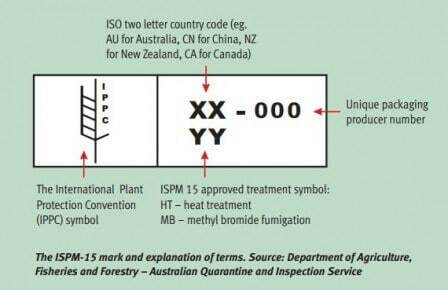 Seen here, the ISPM-15 mark is now commonly seen on wood packaging that comes from Australia, including pallets. The mark may include additional information. Instead of using pallets that have been marked chemically or pressure treated, find hardwood pallets that have been heat-treated. 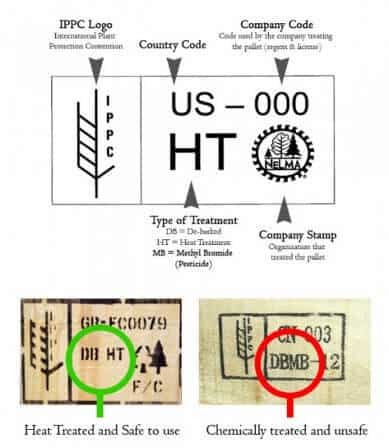 These US Pallet Treatment Stamps will be helpful for identifying good wood to use. If you live in Australia, you will want to check out the brochure Recycling Wood Pallets and Packaging. This will contain many tips concerning different uses, imported and local pallet chemical treatments, and where wood recycling businesses are located. In order to avoid any chemical contamination, make sure you are aware of what the pallets were used for in the past. Choose only safe containers for planting any food, especially if the pallet was used before you acquired it for your project. There are many variations of lumber used in pallets. Timber is porous and may become a breeding environment for molds and bacteria, especially when being used in humid or wet conditions. Most pallets are treated with chemicals in order to prevent fungal and insect attacks, especially if the pallets have been imported. Make sure to use caution when selecting the pallets you will use. You should avoid composite wood pallets and dust from wood containing formaldehyde. There are many helpful tips you can learn in order to identify treated wood and wood types that you will not want to use. You may also want to spend some time learning about pressure treated wood and its uses, and whether or not it may be safe to use as far as growing food is concerned. 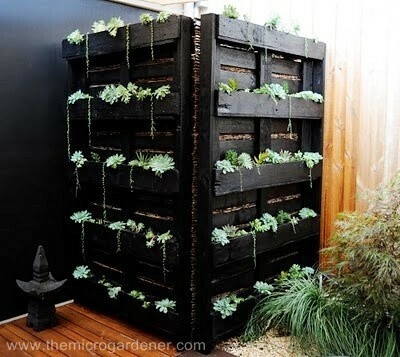 There will need to be a little planning concerning vertical pallet gardens, so you can make the most of what you have to work with. 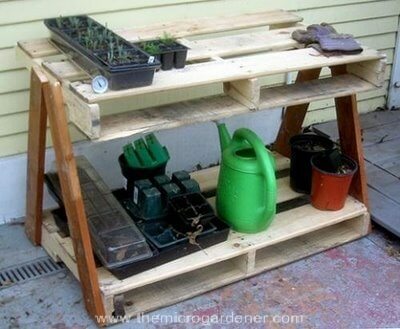 First, to make benches more easily accessible and create horizontal storage space, stack pallets on top of each other. This is ideal for benches in areas known to flood or hold water. In order to grow well, plants need to receive the proper light, nutrients, and moisture, regardless of the type of container they grow in. You might want to look into installing a drip irrigation system before adding the pallet in order to avoid spending a lot of time watering by hand. Succulents and other plants requiring lower amounts of water are ideal for the bottom two rows of the garden. 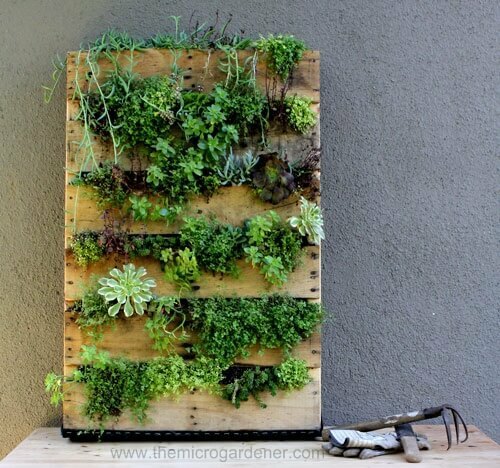 A potting mix that can both hold a high capacity of water and is rich in nutrients should be used for your vertical pallet garden. 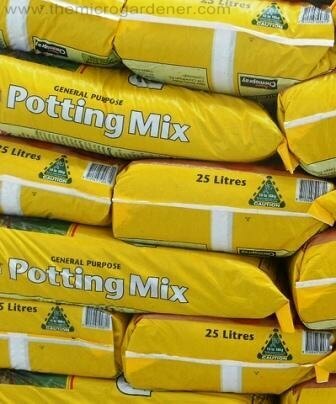 Without the addition of other ingredients, a bagged soil mix may dry out too quickly and could even starve your plants. In order to retain the soil and prevent a mess while watering, you may want to add a second layer of landscaping fabric underneath the timber slats along the front of the pallet garden. Of course, this will also depend on the type of plants you intend on planting. Perennial plants will not need to be replaced as often as an annual. You may want to use these if you are looking to cut down on the maintenance that required for your garden. In order for your garden to remain healthy, maintenance will be required for intensive planting. Make sure to keep in mind the amount of time have to invest before you start planning out your garden. Double check the regulations as far as what renters are allowed to do for balcony gardens. 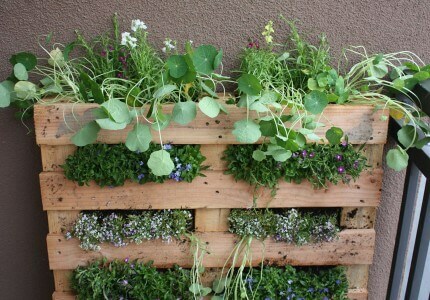 Keep in mind that your vertical pallet garden will add weight to the balcony or railing. Always be courteous and ask before taking pallets from any commercial location. Several businesses are more than happy to get rid of pallets, but some need to return them in order to have their deposit refunded. Any time you are handling timber or pallets, be sure to wear gloves to prevent injury from staples, nails, or splinters. 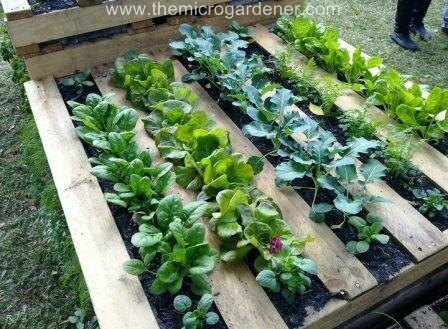 You can also use pallets to keep your contained garden elevated from the ground. 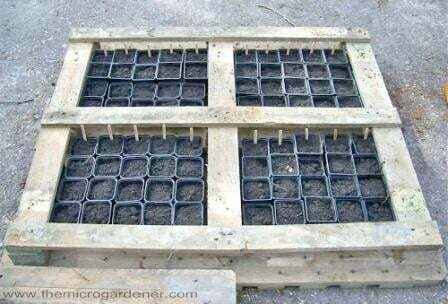 If you have plants that need to be moved in and out of the rain, you can make a portable garden by screwing 4 strong castors into the bottom corners of a pallet. Here is a link to watch a quick video for tips on how to safely dismantle a pallet for your project.